Find the 800 number you’re looking for in the national toll free numbers directory. Update 2017: If you are looking for a list of 1-800 numbers you found the right place. UniTel Voice allows you to search the national toll free number directory in real time to find the perfect toll free number for your business. If the 1800 number you’re looking for is available (i.e., it’s not in use with another company at this time) you can snap it up for your business. One thing to note, toll free numbers come in several different toll free number prefixes including: 800, 888, 877, 855, 844 and newly released 833 toll free numbers. And it’s a bit harder to find 1-800 numbers than it is to get a toll free number with the other prefixes because 800 numbers where first released in the 1960s and therefore are almost all in use. The national toll free number directory’s spare pool of numbers is mostly made up of 855, 844, and 833 numbers. 1. If a toll free number is disconnected – how do I get it? 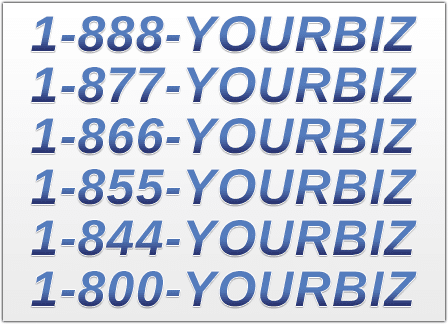 Ever come up with the perfect idea for a vanity 1800 number (i.e., 1-800-YOURBIZ)? You know that having that number would help you brand and market your business, so you decide to just call the number. Shortly after you call the number you hear, “we’re sorry, your call cannot be completed as dialed”. You think “great the number is disconnected so it must be available”. Unfortunately, that’s not always what that means and in most cases (especially with 1800 numbers) when you hear that message or a similar message – it seemly means that the 800 number disconnected in the sense that it is not ringing through to a local number. The 800 number is still in use and owned by some business and it’s not available for you to purchase. Unfortunately thousands of 800 numbers are in this state for various reasons and there’s no way to find out what business owns the number. The only information you might be able to dig up is what phone company is carrier the number but that Phone Company won’t tell you who their customer is because that information is kept private. 2. Is there a GoDaddy for toll free numbers? Unfortunately no, not really. There’s almost no way to get toll free numbers that are disconnected but still technically in use. All available toll free numbers are housed in a directory managed by an FCC directed organization known as Somos (formally called sms800). Somos allows certain phone companies like AT&T and UniTel Voice to become Resp Orgs (responsible organizations) and in doing so, allows them to build toll free number directory search tools (like the one on UniTel Voice’s signup page). The UniTel Voice’s search tool searches the directory in real time and allows you to search by number combination, word, phrase, or wildcards (the asterisk symbol). Another nice feature our search tool offers is “suggestions”. In other words, if the number you want isn’t available the search results will often give you close alternatives that are available. 3. How do I find a great vanity 1800 number?